Paragraph 1.02 The objective of each team is to win by scoring more runs than the opponent. Baseball fan and comedian George Carlin states it this way: "In baseball the object is to go home." It can't get much simpler than that (though while playing the game is simple, laying out the field is another matter). Yet when one attempts to determine what players are the most skilled at "going home", or are the most talented at helping their teammates "go home", obtaining answers isn't so simple. A particularly vexing problem is comparing players from different eras. One complicating factor is that the baseball rule book has changed every year since the first rule book for the National League was issued in 1877. Prior to the 1930 American League season, and prior to the 1931 National League season, fly balls that bounced over or through the outfield fence were home runs! All batted balls that cleared or went through the fence on the fly or that were hit more than 250 feet in the air and cleared or went through the fence after a bounce in fair territory were counted as home runs. After the rule change the batter was awarded second base and these were called "automatic doubles" (ground-rule doubles are ballpark-specific rules) and are covered by rule 6.09(d)-(h) in the MLB Rule Book. 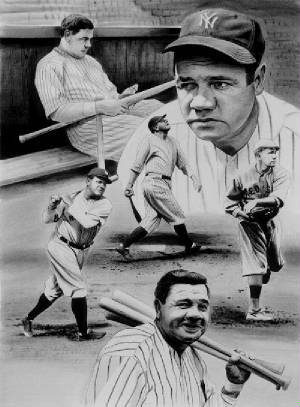 Babe Ruth reportedly had no "bounce" home runs; Lou Gehrig had a few, so did Rogers Hornsby and many, many other players of that era. The picture at the upper left does not portray an actual occurrence of a "bounce" home run under the old rule, but it does depict the effort by Jose Canseco of the Texas Rangers to turn the baseball clock back in time to his version of the rule. 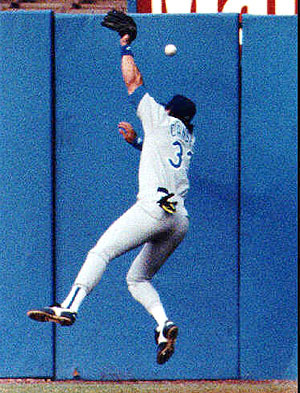 On May 26, 1993 Canseco was drifting back to deep right field to catch a routine fly ball hit in the 4th inning by Carlos Martinez of the Cleveland Indians. By all appearances it was going to be an easy catch. Not only did Canseco not catch the ball but, in true soccer fashion, his initial and only contact with the in-flight ball was with his head. The ball's new post-impact trajectory, combined with its increased velocity (caused by the steel plates in Canseco's head according to Ranger's pitcher Kenny Rogers, the beneficiary of Canseco's defensive exploits) propelled the ball over the fence for a home run. Texas lost 7-6. Two days later the Harrisburg (PA) Heat of the National Professional Soccer League offered Canseco a contract. You just can't make this stuff up. With the exception of a couple of months at the start of the 1920 season, from 1906 to 1930 the foul lines were "infinitely long": A fly ball over the fence had to land in fair territory (as determined by the infinitely long foul lines), or be fair when last seen by the umpire, in order to be a home run.. In other words, a fly ball that went over the fence in fair territory but "hooked" around the foul pole (if there was a foul pole) was ruled a foul ball. Old pictures of the New York Polo Grounds show ropes strung in line with the foul lines from each foul pole to the back of the stadium to assist the umpire in determining whether a "home run" was fair when last seen. The current rule, rule 6.09(d), says only that the ball must be fair when it goes over the fence. "On August 21,1920, Babe launched one far over the right field grandstand roof at the Polo Grounds. It was obviously fair when it left the park and Ruth proceeded to trot around the bases. When he arrived at home plate, the umpire disallowed the homer with the explanation that the ball had landed on foul ground somewhere out in Manhattan Field." (As Bob Uecker would say, "you'll need a visa to go find that ball") (my comment). Part of the rationale for the "infinitely long" foul lines is that in the early years ballparks did not always have foul poles. When a long fly ball was hit down the left or right field foul line, the absence of foul poles made it difficult to determine the status of an airborne ball relative to the foul line when it broke the plane of the outfield fence. It was easier to determine the fair/foul status by viewing (or estimating) the eventual landing point. Foul poles now have a screen two feet wide attached to the fair side of the pole to serve as an additional visual aid for the umpire on the really close calls. Roundoff error, baseball version.. Most folks know that foul poles are really "fair" poles since they are in fair territory. But the folks who put the finishing touches on Dodger Stadium (aka Chavez Ravine) apparently interpreted the foul pole designation literally. During their inaugural season (1962) in the ballpark, the Dodgers discovered that the foul poles were yes indeed, positioned entirely in foul territory (as clearly seen in picture at right). A special dispensation by the National League allowed the foul poles to stay foul the rest of the season. After the season, rather than reconfiguring the poles, the groundskeepers moved back home plate, and tweaked the location of the bases and the pitching rubber, to make the foul poles fair. Until 1920, in the last of the ninth inning or in the bottom of an extra inning, home runs that drove in the winning run ahead of them were scored only as singles, doubles, or triples, according to how many bases the baserunner needed to advance to score the winning run. For example, if the batter hit a home run in the bottom of the ninth inning with a teammate on third base and the score tied, the batter was credited with only a single. Under current rules, the batter would be credited with a "walk-off" home run and the home team would win by two runs. In 1918 Babe Ruth hit a "home run" with a teammate on first base in the bottom of the ninth inning of a tied game. Under the rules of the day, Ruth was credited with a triple. In 1968 the Special Baseball Records Committee voted to restore home runs to players who had lost credit for them because of the above-mentioned pre-1920 rule. But even people in power tinker with baseball's traditions and statistics at great peril. After a hyper-decibel outcry by casual and serious fans, the committee changed its mind in 1969. The table below shows how the game of baseball evolved from 1876, when the National League was formed, to 1920. From Beer-League Softball to Major League Baseball: The First 44 Years of the National/Major Leagues. 1846: first recorded argument between a player and an umpire (guess who won the argument). Well. From the above information it is clear that not all similarly-named baseball statistics convey at face-value comparable information when viewed across the years. And even when the drastic rule changes slowed after 1900, changes in equipment, training, strategy, ballparks, the available talent pool, with the advent of night baseball, relief pitchers, and designated hitters all resulted in creating "eras" of the game. Using basic statistics, new measures of performance at various levels of sophistication have been developed to adjust for each era's idiosyncracies and to more or less standardize many player and team performance measures. Have some fun resurrecting the old-timers or sending current players back in time to go toe-to-toe with Ty Cobb or The Babe. The adjustments used at this site are at the lower end of the sophistication scale (no ballpark effects are included, for example) but the site is well-done and you can read about the basic statistical adjustments that are used. Read more about traditional and recently-developed baseball statistics here. Correct answers are indicated by an audio of a home run call [(Babe Ruth, Hank Aaron (career #715), Bobby Thompson ('51 playoff "shot heard 'round the world"), Kirk Gibson ('88 World Series game 1), Mark McGwire (#62) or Eddie Murray (career #500)]. Incorrect answers result in "boos", a Harry Caray "holy cow", poor Bill Buckner's infamous error in the '86 World Series (sorry, Boston Red Sox fans), or a Bob Uecker audio. Question 1. Approximately how much does an official baseball weigh? Question 2. Approximately how big around is an official baseball? Question 3. How many balls are usually made available for use at the beginning of each major league game? Before a game an umpire removes the sheen from each new ball by rubbing it with river mud obtained from what location? Question 4. What is the maximum allowed length of a bat? What is the maximum allowed diameter? Question 5. The following excerpt, with key words deleted, is taken from the Official Major Leagues Rulebook. It shall be a 17 inch square with two of the corners removed so that one edge is 17 inches long, two adjacent sides are 8 1/2 inches and the remaining two sides are 12 inches and set at an angle to (delete). What item is being described? Question 6. To play in the Major Leagues a player's height must exceed what value? Question 1: A. 5 ounces; Question 2: C. 9 inches. The ball shall be a sphere formed by yarn wound around a small core of cork, rubber or similar material, covered with two stripes of white horsehide or cowhide, tightly stitched together. It shall weigh not less than five nor more than 5 1/4 ounces avoirdupois and measure not less than nine nor more than 9 1/4 inches in circumference. From 1877 to 1976 the A.G. Spalding Company of Chicopee, Mass. was the exclusive major league supplier of baseballs. Rawlings Sporting Goods of St. Louis, Mo. began to supply the balls in 1977. Until 1975 the rules required that the ball covers be made of horsehide, but as horsehide became more expensive, in 1975 the rule was changed to allow either horsehide or cowhide. Rawlings uses only cowhide. The Rawlings production facility in Costa Rica produces over 20,000 dozen major league game balls a year (minor league baseballs are made at the Rawlings plant in China). Each ball comes carefully crafted, weighed, measured, tested, inspected, and re-inspected. 5 to 5.25 ounces, 108 stitches. Each ball is hand-sewn. It takes about 10 minutes for a sewer to sew the 108 stitches on each baseball. The first and last stitches are cleverly hidden. The average life of a baseball in the Majors is 6 pitches. In most ballparks six dozen balls are readied prior to each game. This number is not specified in the rule book and is not fixed. In some ballparks (e.g., those with smaller areas of foul territory that result in more foul popups landing in the stands) seven dozen balls are readied. The average life of a ball is 6 pitches. 3.01 Before the game begins the umpire shall: (c) Receive from the home club a supply of regulation baseballs, the number and make to be certified to the home club by the league president. Each ball shall be enclosed in a sealed package bearing the signature of the league president, and the seal shall not be broken until just prior to game time when the umpire shall open each package to inspect the ball and remove its gloss. The umpire shall be the sole judge of the fitness of the balls to be used in the game. Before every game the umpires (and/or clubhouse workers) rub down each ball with river-bottom mud obtained from a tributary of the Delaware River in New Jersey. No kidding; this is not a Jimmy Hoffa joke. 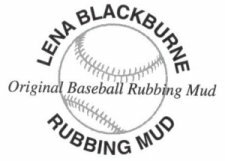 Read about this mysterious substance, Lena Blackburne's Baseball Rubbing Mud, here. The mud removes the sheen from the ball and makes it easier to grip without discoloring the ball or damaging the ball's cover. The same mud has been used by all Major League teams and most minor league teams since the 1950's. Prior to the 1950's baseballs were treated with mud made with dirt from the infield where the game was to be held. The results were highly variable and in general quite unsatisfactory; in addition to discoloration, the horsehide/cowhide covers were frequently softened, making the balls susceptible to an array of illegal alterations by wily pitchers with industrial-strength fingernails or small abrasive tools strategically placed on their person or in their gloves. Solving the "mud" issue was no small matter since many pitchers are adherents of the philosophy "if you're not cheating, you're not trying". Atlanta Braves announcer and Hall of Fame pitcher Don Sutton earned the moniker "Black and Decker" from fellow players for his ingenuity and unparalleled sleight-of-hand skill with sandpaper. 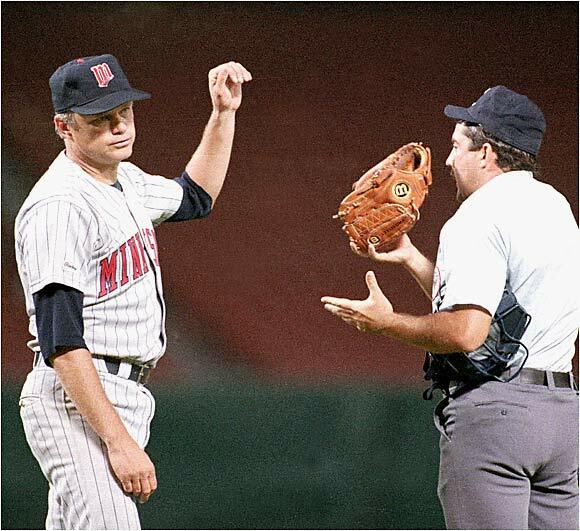 At left, when Minnesota Twins pitcher Joe Neikro was confronted on the mound in the middle of a game by the home plate umpire and asked to empty his pockets, an emery board floated to the ground. Joe was given a 10 game suspension and a "doctor" of baseball degree for his efforts. 1.10 (a) The bat shall be a smooth, round stick not more than 2 3/4 inches in diameter at the thickest part and not more than 42 inches in length. The bat shall be one piece of solid wood. NOTE: No laminated or experimental bats shall be used in a professional game (either championship season or exhibition games) until the manufacturer has secured approval from the Rules Committee of his design and methods of manufacture. 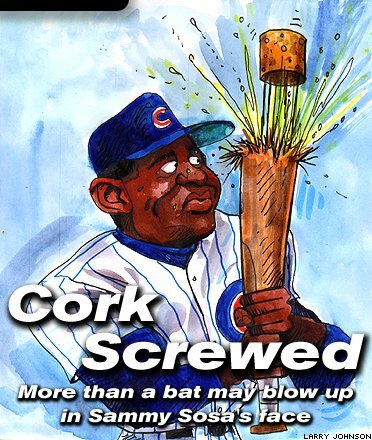 (b) Cupped Bats. An indentation in the end of the bat up to one inch in depth is permitted and may be no wider than two inches and no less than one inch in diameter. The indentation must be curved with no foreign substance added. (c) The bat handle, for not more than 18 inches from its end, may be covered or treated with any material or substance to improve the grip. Any such material or substance, which extends past the 18 inch limitation, shall cause the bat to be removed from the game. NOTE: If the umpire discovers that the bat does not conform to (c) above until a time during or after which the bat has been used in play, it shall not be grounds for declaring the batter out, or ejected from the game. 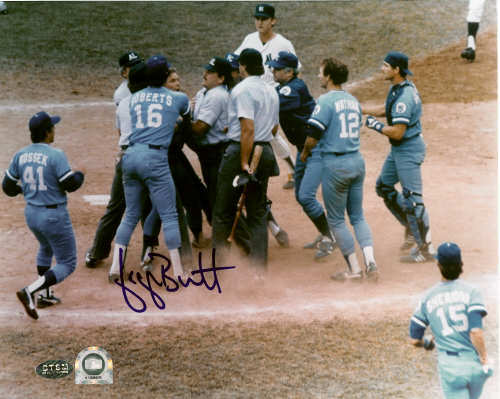 The NOTE after (c) was added after the famous George Brett pine tar incident on July 24, 1983. OOPS! Sammy Sosa apparently didn't think the word "solid" in 1.10(a) applied to him. Do corked bats help the hitter? Many players prefer to use black-colored bats, particularly during night games, because it is more difficult for the fielders to see the ball coming off the bat. Note that there is no weight limit on the bat. Current players use lighter bats than the oldtimers did. Barry Bonds uses a 32 oz. bat, Ken Griffey is around 31 oz. During the 2005 season Alfonso Soriano's 33 oz. bat was the heaviest used on the Yanks. Home base shall be marked by a five sided slab of whitened rubber. It shall be a 17 inch square with two of the corners removed so that one edge is 17 inches long, two adjacent sides are 8 1/2 inches and the remaining two sides are 12 inches and set at an angle to make a point. 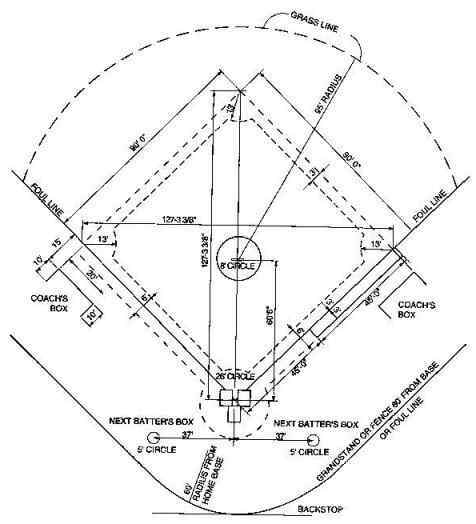 It shall be set in the ground with the point at the intersection of the lines extending from home base to first base and to third base; with the 17 inch edge facing the pitcher's plate, and the two 12 inch edges coinciding with the first and third base lines. The top edges of home base shall be beveled and the base shall be fixed in the ground level with the ground surface. Fans are frequently confused about whether home plate is in fair or foul territory. Like first, second, and third base, home plate is in fair territory - the baselines intersect at the back point of home plate. Until 1887 home plate could be made either of whitened rubber or marble. OUCH! One famous attempt to capitalize on the absence of a minimum height requirement met with short (no pun intended) term, but not long term, success. 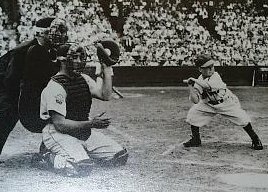 The most publicized stunt in baseball history took place August 19, 1951, at Sportsman's Park in St. Louis, when, to the roar of 18,369 fans, all 3 feet 7 inches and 65 pounds of 26 year-old Eddie Gaedel emerged from the St. Louis Browns dugout to pinch hit. Gaedel was wearing a Browns uniform with the number 1/8 and had a toy-like bat. Bill Veeck (my all-time favorite pro sports executive), the owner of the St. Louis Browns, had instructed Gaedel that under no circumstances was he to swing at a pitch. To make his point, Veeck reportedly told Gaedel that a sharpshooter with a scope rifle was positioned in the centerfield scoreboard and that if Gaedel swung at a pitch, he would be shot on the spot (the existence of the sharpshooter has never been verified). Detroit manager Red Rolfe protested Gaedel's participation to the home plate umpire, but St. Louis manager Zachary Taylor produced a legitimate contract, filed with the AL and cleared by umpire Ed Hurley. When positioned in his normal batting stance, Gaedel's strike zone measured about 6 inches top to bottom (see above picture). Naturally, Detroit pitcher Bob Cain walked Gaedel on four straight pitches. When Jim Delsing went in to run for him, the crowd gave Gaedel a standing ovation. This was Gaedel's only at bat in a major league game since he was promptly banned from the league by AL president Will Harridge. This infuriated Veeck who, with his typical gadfly ingenuity, threatened to retaliate by demanding a ruling on Yankee shortstop Phil Rizzuto (listed as 5'6") to determine whether he was a short ballplayer or a tall member of the newly banned class. 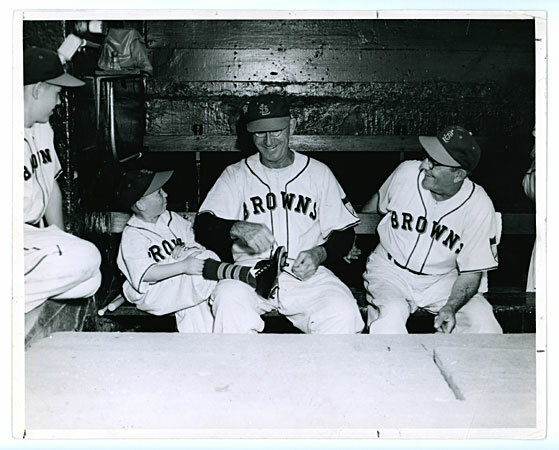 Below: Aug. 19, 1951, some of the St. Louis Browns relax in the dugout before Eddie Gaedel's big game. Can you guess which one is Eddie? (Notice Eddie's bats on the bench at lower left). An INFIELD FLY is a fair fly ball (not including a line drive nor an attempted bunt) which can be caught by an infielder with ordinary effort, when first and second, or first, second and third bases are occupied, before two are out. The pitcher, catcher and any outfielder who stations himself in the infield on the play shall be considered infielders for the purpose of this rule. When it seems apparent that a batted ball will be an Infield Fly, the umpire shall immediately declare "Infield Fly" for the benefit of the runners. If the ball is near the baselines, the umpire shall declare "Infield Fly, if Fair." The ball is alive and runners may advance at the risk of the ball being caught, or retouch and advance after the ball is touched, the same as on any fly ball. If the hit becomes a foul ball, it is treated the same as any foul. If a declared Infield Fly is allowed to fall untouched to the ground, and bounces foul before passing first or third base, it is a foul ball. If a declared Infield Fly falls untouched to the ground outside the baseline, and bounces fair before passing first or third base, it is an Infield Fly. On the infield fly rule the umpire is to rule whether the ball could ordinarily have been handled by an infielder_not by some arbitrary limitation such as the grass, or the base lines. The umpire must rule also that a ball is an infield fly, even if handled by an outfielder, if, in the umpire's judgment, the ball could have been as easily handled by an infielder. The infield fly is in no sense to be considered an appeal play. The umpire's judgment must govern, and the decision should be made immediately. When an infield fly rule is called, runners may advance at their own risk. If on an infield fly rule, the infielder intentionally drops a fair ball, the ball remains in play despite the provisions of Rule 6.05 (L). The infield fly rule takes precedence. 1. Michael J. Schell, Baseball's All-time Best Hitters, How Statistics Can Level the Playing Field, Princeton University Press, Princeton, New Jersey 1999. 2. R. Wayne Schmittberger, Test Your Baseball Literacy, John Wiley & Sons, New York, 1991.
and the web pages linked to on this page.